Most people generally don't begin reading a series with the ninth volume, but we all make different choices in life and that's the choice I made with Madness in Solidar. Madness in Solidar is the ninth volume of L.E. Modesitt, Jr.'s long running Imager Portfolio series. 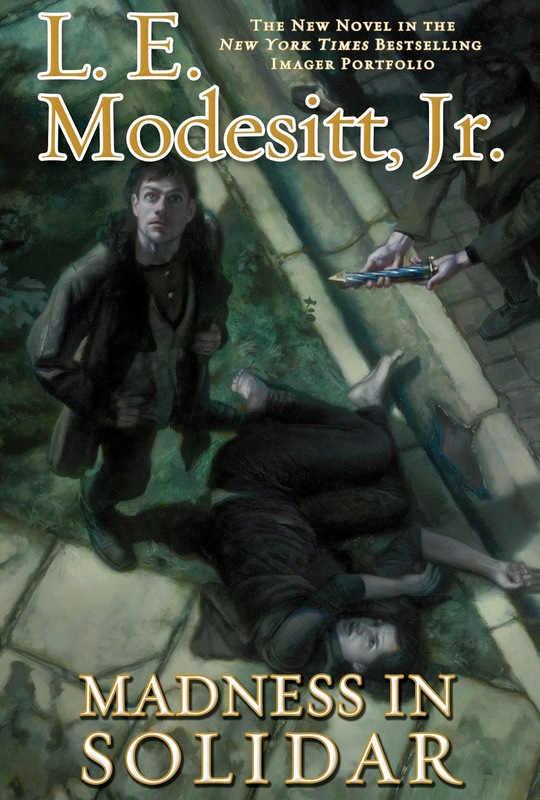 Having read all eighteen novels so far published in Modesitt's Recluce series, I was reluctant to begin another impossibly long series from the same author. I can't speak to how Madness in Solidar presents to readers most familiar with the eight previous novels in the Imager Portfolio, but it works as a fairly solid entry point because Modesitt tends to set his novels in different eras so that Madness in Solidar stands alone for new readers while enhancing the richness of the Imager world for longtime readers. Here we are several hundred years after the founding of the Collegium of Imagers (think: magic school) and the power of the school is very much in decline. The school, now led by a man named Alastar, is caught between High Holders (think: land owning nobility) and the Rex (think: a king, but not in a fully absolute monarch). The Collegium is beholden to the Rex for funding, and despite the awesome power the school wields, is in the difficult position of being a feared and persecuted minority living somewhat on the forbearance of others. As the saying goes, people fear what they don't understand and the power of the Imagers is one of those things. This is a recurring theme throughout Modesitt's work, the fear of the magical other. That, and the desire of those in power to maintain their power and command exactly in the manner it has "always" been and without finding a way to work towards a mutually beneficial solution. And so, in life as in a Modesitt novel, death and destruction usually follow a man doing what he needs to do in order to survive and protect his people. Reading a Modesitt novel is like coming home. It's comfort reading of the highest order. You have a fairly good idea what sort of novel you are going to get and Modesitt delivers exactly that. 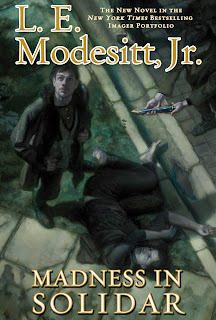 Alastar may not be quite the prototypical Modesitt protagonist in that he begins the novel with as a full grown adult in command of his powers and maturity (rather than being a young adult cast out to find his own way), but in other ways he is very much that protagonist. Alastar is newly in command of the Collegium and caught between two significant powers pulling him in different directions while Alastar's work is to keep the Collegium whole and perhaps even increase its power. Madness in Solidar is a deliberate novel that lives and breathes in the details of Alastar's daily life of running the Collegium during this time of crisis. It lives on those moments of the discipline of students, in the correction of the kitchen staff, in the planning of building a road for the rex, and in the strategic planning for how the Collegium could be more independent in the future. This may not necessarily sound like the most riveting stuff for a fantasy novel, but in Modesitt's hands it is compelling and it builds the stage (before setting the stage) for the explosion of novel's looming conflict. It builds, brick by brick. Madness in Solidar is a slow build, perhaps a little slower than a number of Modesitt's other novels, but this is familiar pacing for longtime readers of Modesitt. The time he takes to set up the characters, the long burn of the story, is time well spent in the world of the Imager Portfolio. I can only imagine readers more familiar with the history of this world will be even more rewarded by how Modesitt builds on the previous novels, but happily Madness in Solidar is a novel which also stands on its own. Bonuses: +1 for Alyna, a character I could have written an essay on. Penalties: -1 because readers new to the series might spend too much time wondering what references to previous books they are missing and if that matters.